A disaster brings not only devastation and human suffering but inevitable confusion as communication breaks down and the health aspects of the disaster become difficult and sometimes impossible to track. Battling that confusion is among the first steps toward disaster recovery, and one of the reasons the National Library of Medicine Disaster Information Management Research Center (DIMRC) was created in 2008 with the goal of providing health resources from librarians when critical information on topics such as radiation or hazardous materials exposure is urgently needed at a disaster site. Disaster information specialists also have a variety of tools from the National Library of Medicine they can use, including resources that help emergency and disaster personnel respond to hazardous materials and radiation events. The recovery phase from a disaster can sometimes go on for weeks and months, and here, too, the disaster information specialist can guide patrons in using library resources and Internet connections to track missing people, contact family members, send e-mails, and fill out the claim forms that accompany a disaster. In planning since August 2010, the NLM is sponsoring a Disaster Information Outreach Symposium March 29-30 to explore the expanding role of the disaster information specialist and promote awareness that any librarian can become a disaster information specialist. Most librarians will never be full-time disaster information providers, but can learn the core competencies and assist when needed, says Love. “We are the bridge that joins groups,” says Patti Reynolds, the Director of the Bishopric Medical Library at Sarasota Memorial Hospital in Sarasota, Florida, who is a presenter at the upcoming symposium. In a hospital that is planning for disaster events, says Reynolds, there are competing interests. It is natural for clinical personnel to be concerned with medical issues, while an operations person might be focused on site issues such as security. “The disaster information librarian is a bit like Switzerland,” Reynolds says, “totally neutral but serving as an impartial helper during a disaster.” She was one of the original participants in the Disaster Information Specialist Pilot Project Partnership, now the Disaster Information Specialist Program. Reynolds worked with nursing departments and physicians developing “champions” in each group that can respond during an emergency. She also helped build an emergency sub-committee that became a standing committee at Sarasota Memorial Hospital, including head nurses, the security director, and the Chief Medical Officer. Reynolds has expanded her efforts working now with the clinical departments and security departments at local and regional medical facilities to develop a county-wide coalition, the Suncoast Emergency Preparedness Information Center (EPIC) for health care providers, which offers links to federal, state, and local health care systems and resources such as DIMRC. One of the more successful outreach efforts from DIMRC is the creation and growth of an international disaster health information listserv (DISASTR-OUTREACH-LIB) that now has more than 600 members who share information. Cara Breeden, who administers the list, says that disaster information outreach is still growing and that as mobile devices and social media such as Twitter and Facebook become ever more popular, access to disaster information is expanding worldwide and the capacity of medical libraries in disaster preparedness, response and recovery is increasing. One of the defining events that brought the disaster information community together was the catastrophic January 2010 earthquake in Haiti. DIMRC responded with a special Haiti Web site, as it has done with Japan’s recent earthquake and tsunami. During recovery from the Haiti earthquake, DIMRC worked with such volunteers as Dr. Mary Moore from the Louis Calder Medical Library at the University of Miami Miller School of Medicine, which has a longstanding tradition of sending medical teams to Haiti. Like everyone else, Moore was following news of the disaster, and wanted to help. But, she knew the need for the basics—food, water, antibiotics—was most pressing, and she was unsure of the appropriate way to make her library’s services known. As luck would have it, Cindy Love happened to call Moore right before a library meeting and from there was able to participate in a conference call to focus their joint efforts. She suggested core textbooks and articles to print out, which were then assembled into boxes, ready to go out to the team to Haiti. “It’s my goal to give librarians the tools and contacts they need in disasters and assure them they are not alone,” said DIMRC’s Love. Registration for on-site attendance at the Disaster Information Outreach Symposium is full, but the event will be videocast. You may wish to visit http://videocast.nih.gov prior to the symposium to check if you need to download the free RealPlayer program to your computer. There is a direct link to the videocast for Day 1 and for Day 2. A recording will be archived for later viewing following the symposium. 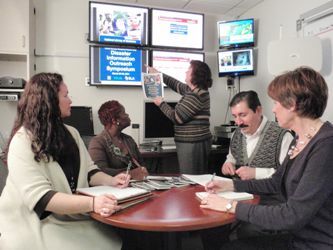 Photo Caption: Planning for the NLM’s Disaster Information Outreach Symposium. From left, Jennifer Pakiam, Danica Miller, Cindy Love, Victor Cid, and Elizabeth Norton. Photo by James Charuhas.